My future anti-kitty force field is coming along swimmingly. I'm through 46 of 90 rounds but I'm not actually half way through like that might sound. Almost each round increases the stitch count so while round 45 has about 180 stitches, round 88 has over 300 and the final round has almost 400. So yeah, progress has begun to slow down a bit. I think it will take me a lot longer than three days to get through the second half of the rounds. That's okay though. It will give me a chance to decide what socks I want to do next, owls or sheep? Decisions, decisions! Pretty! Which owls or sheep pattern are you deciding between? Almost done with my current socks as well, need some more patterns to look at. Sigh. A kitty is trying to help me type so I had to delete my comment. Take two! I'm debating between Owlie Socks and Biscotte's Sheeps. I think I'm leaning towards the owls but I have all the stuff for both in my stash so really it's just a matter of time before I do them both. Have you seen any of the socks from the Op-Art Socks book? I got it for Christmas and it's just crazy! 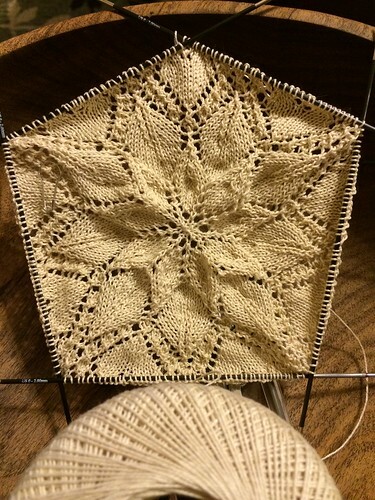 I want to make like five of the patterns, but particularly Ludwig. Even if you don't like colorwork, the socks are still fun to look at! Very trippy! Oh I have both of these patterns in my favorites and need to work up the nerve to do color work. I really like the owls though. Don't be scared of colorwork - it's amazingly easy! The hardest for me was figuring out my best way to tension both yarns but it didn't take long to work out what worked for me. Other than that, it's just stockinette! Nah! The holes are small enough (just single yarn overs on size US0) that it won't phase or interest the kitties at all. Also, I already have something laying over the knitting bowl that no one bothers with and it's more kitty-dance friendly than the lace will be. Only Bitty has done anything with the knitting bowl and she just stood in it while it was empty (and uncovered).